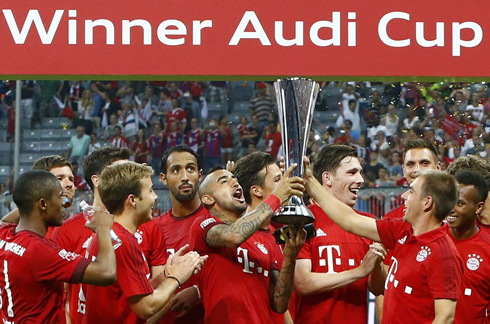 There was no safe passage for Real Madrid in Munich this time around, as the Merengues were beaten by Pep Guardiola's men by 1-0 in the Audi Cup final. Ronaldo missed his second consecutive game due to injury and it ended up being Robert Lewandowski striking the late but decisive blow of the game. It's never easy to play against Bayern in Munich, much less if a team goes into the Allianz Arena without their main players on the pitch. 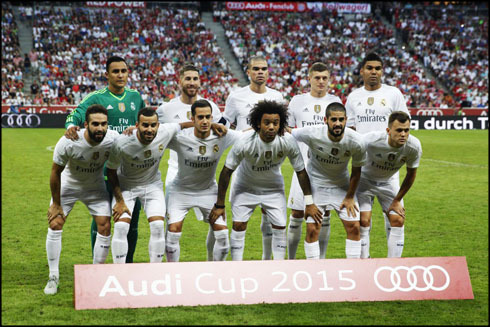 Real Madrid suffered a 1-0 loss at the hands of Bayern Munich in the final of the Audi Cup, just one day after having beaten Tottenham in the semi-finals of the tournament. Rafa Benítez rotated almost every player that had been on the pitch the day before and saw his side being dominated throughout most of the 90 minutes in Munich. Nevertheless, the Merengues still offered a good resistance to the hosts' thirst for blood and Keylor Navas ended up only conceding the winning goal close to the 88th minute of the game, in a close range tap-in from Robert Lewandowski. Real plays again this Sunday against Valerenga in Oslo (Norway) and the good news is that Ronaldo should already be fit to play again. Madrid's defensive wall may have only been brought down close to the end of the game, but it's not like we can say it was a very unfair outcome... Benítez built his team with a clear intent to defend tight and close almost every possible space at the back, but the Merengues found plenty of troubles to keep Douglas Costa quiet on the wings. The Brazilian ended up being decisive in the set-up of the winning goal, as he assisted Robert Lewandowski for a quite easy finish. Right from the start, it looked like Guardiola was taking this game a bit more seriously than Benítez. While Bayern's starting eleven probably already included most of their expected starters this season (with the exception of 2 or perhaps 3 players), Real Madrid presented a somewhat second-tier lineup, missing most of their key players like Cristiano Ronaldo, Gareth Bale, Benzema, Modric and James Rodríguez. Real Madrid's best player on the night was most likely Keylor Navas, who finally had the chance to put on a great display for the Merengues, with plenty of saves against the attacking avalanche that was already expected from Bayern Munchen. The Costa Rica international just couldn't keep a clean sheet until the final whistle though, as a late strike from Lewandowski in the 88th minute ended up breaking the deadlock. The former Borussia Dortmund forward tapped in a great cross from Douglas Costa sent in from the right, scoring yet again against one of his favorite opponents. It was Madrid's first loss in regular time in this pre-season (they lost to AS Roma in July after a penalty shootout), but the Merengues are certainly hoping to get back on track right next Sunday, when they visit Valerenga in Olso, Norway. Cristiano Ronaldo has been recovering from his back injury in Valdebebas and according to the latest reports coming from Spain, he should be back to normal practice with the team later this week, more than in time to still get some playing minutes against the Norwegian side. Attackers: Cheryshev, Lucas Vázquez, Jesé Rodríguez. Cristiano Ronaldo next game will be for Real Madrid, on the 9th of August of 2015 against Valerenga. You can watch Juventus live stream, Valerenga vs Real Madrid, Barcelona vs Sevilla, Man United vs Tottenham, Chelsea vs Swansea City, and Everton vs Watford, all matches provided from our soccer live section.